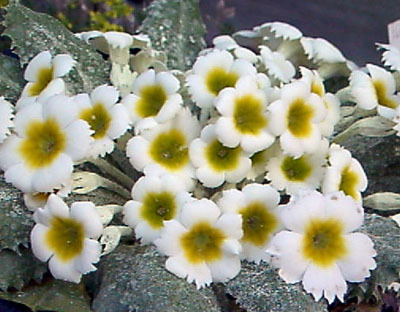 Primula ‘Netta Dennis’ is a plant that is often seen at the spring shows of the AGS & SRG, and is indeed a show stopper; mealy green grey leaves, and the beautiful pale lemon flowers with the dark yellow centre. I have struggled with this plant; there are times when I would have amply enough plants to place it in my plant list, then there are other times, like now when I am down to just a few plants. A Mr. John Dennis from Doncaster in Yorkshire bred the plant. The cross he made was by Primula aureata (yellow) from central Nepal ‘to the north of Kathmandu’, and Primula petiolaris that has pink flowers and is found growing in its natural habitat of Nepal and Sikkim, recorded to be growing at around 2100m to 3800m. 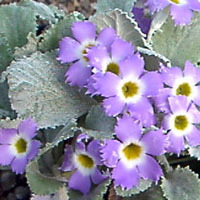 Knowing where the Primula grow, gives you some idea as to what growing condition Asiatic Primula like and is not always easy to copy in the garden especially if the summers are warm and dry. In 2006 in Ireland we did have what you might call ‘a bit of summer’, few weeks of high temperatures for us. I grow the easy petiolaris primula in the garden where the ground never dries out, as we do have spring wells on our land, which can be an advantage or disadvantage depending on what you wish to grow. I have never been brave enough to plant out Primula aureata, P. nana (edgeworthii) or Primula ‘Netta Dennis’ and have kept them in pots, under glass, at the cool end of the glasshouse with the louvres open all the time. Even these plants were beginning to suffer with the heat, and constant watering is not a help as the root becomes very hot, the plant does not seem to take up any water, and it begins to look sad and then it dies. The plants were beginning to send messages to me like ‘help’, so drastic action had to be taken. In the part of the garden close to the nursery we do have a woodland garden about one and half acres. We created it ourselves, planting the trees over thirty years ago. These trees are now of a good height, and I am able to underplant with Meconopsis, hardy orchids, Dicksonia, Erythronium, Wood anemone etc., and this is where I have now planted out the Asiatic Primula. 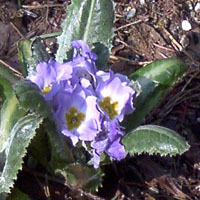 Primula sonchifolia is another beautiful Asiatic Primula, flowering time March - April. This plant will not tolerate dry conditions, it must be planted with the roots in water, if not you will certainly lose this lovely plant. In the winter the plant has a large resting bud, almost egg-like, and in early March the flowers emerge on a short stout flowering stem . I am fortunate enough to be able to grow this plant as I do have water in the garden and plenty of damp areas. I did it when the temperatures were high, and I have to say the plants are looking good coming into winter, and the plants have put on growth. The two trees they are growing under are Picea abies and Pseudotsuga menziesii giving light shade. Planted over thirty years ago, only whips, they are now more than 15m; the ground at the start was very dry, as the trees had thrown a lot of shade before the bottom branches had been taken off and had stopped the rain coming through the canopy of branches, and another observation is that the needles from the trees form a matting; this also prevents rain penetrating into the soil. The ground was dug over, and I have covered to whole area with bark chippings, it was sprayed thoroughly to dampen the chips and the soil underneath the bark chips. I can report I saw some frogs hopping over this area, and if they are there it must be damp, also they will eat the slugs. Preparing Primula ‘Netta Dennis’ for the show benches, I would recommend the plant is kept in a cold frame or a cold glass house, for a least 8 weeks before the show, the reason for this, you do not want water on the foliage of the plant as the farina will be washed off, and the plant will not look so attractive, I also suggest you top dress with fine bark rather than grit; it sets the plant off better.